Can anyone identify this carriage currently captive at Naga? Seems to be part of a local departmental train, a BC (557) wearing the same livery and labeled TOOL CAR. 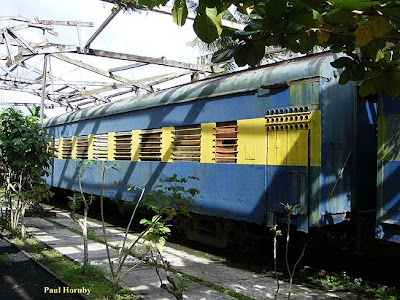 Paul Hornby recently visited this interesting location down in Bicol and took a listing of all wagons present. These will appear on the 'Philippine Fleetlist' website shortly.